Schoolash - Evacuation Bamboo? maybe in your mind for a moment flashed people were evacuated bamboo, certainly not that, but rather the kind of game are using the media to lelakukan evacuation bamboo. What was evacuated.? certainly not the victims but in this game the players are required to issue pimpong balls that are in the bamboo, where the diameter of the bamboo that is used to store water to be poured greater than the bamboo that is used to take the water that will be used to dislodge the ball from the pimpong bamboo is the larger diameter. How to pour the water into the bamboo contained pimpong ball every participant had to use a rope that has been provided and attached to the bamboo that will be used to collect water. Bamboo with different diameters. 1 Small and 1 large (for a ball pimpong to be taken). 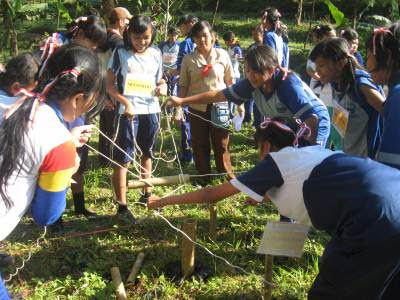 Each group consists of 2-4 people, and had to race to remove the ball from the bamboo pimpong, by pouring water into the bamboo which contains ball pimpong using bamboo tied by rope. How to pour, bamboo water should only be removed using a rope that has been provided (which is already bound to the bamboo). When evacuating, the limbs of each participant must not pass the safety limit of defined areas. Pretty simple is not it,.? although simple but the game was a little tricky, dah requires cooperation and communication among participants in a good team. No we know of any games that we do or we teach the children of our own atapun that do a lot of educational values that we receive or we teach. As the value of discipline, communication, cooperation, and mutual assistance. So now we ask, "what is the value of educational games embedded in this.?". Ok well now be discussed. Initially, each group was not instructed directly elect a leader among them. However, on our way the game each group will choose a group leader either consciously or unconsciously, or the most prominent in providing instuksinya who will be the leader. From there, we can learn that indirectly or directly in fact we are the leader, at least to lead ourselves. Just how we hone our leadership style. In addition, the game also teaches the meaning of cooperation, and tolerance. 0 Response to "Educational Games: Evacuation Bamboo"